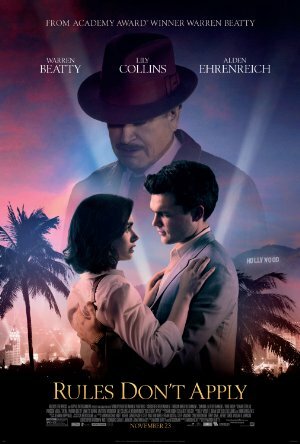 Any expectation that Rules Don’t Apply will be a historically accurate telling of the tale of Howard Hughes, you are warned as the film begins that this will not be the movie you will see. The names and dates have been changed, although not to protect the innocent. The film opens in 1964 at a large press conference in Hollywood where reporters are eagerly awaiting a phone call from Howard Hughes. A biography of Hughes has been published claiming he is incapable of recalling the details of his amazing life and lives in a state of constant depression. In an Acapulco hotel room, “Frank Forbes” (Alden Ehrenreich) is talking to Hughes through a curtain, imploring him to make the call and prevent control of Hughes’ empire being taken from him. Flash back to 1958 and we see a Frank who we learn is a devout Methodist from Fresno, CA; who landed a job working for Howard Hughes as a driver right after arriving in Hollywood. He is dispatched to pick up “Marla Mabery” (Lily Collins) who has just been signed as one of many contract actresses for RKO, Hughes’ movie studio. Marla’s mother “Lucy” (Annette Bening) is traveling with Marla to chaperone her through the den of iniquity she believes Hollywood to be. While the movie’s trailer might make you think the primary story being told is that of an unlikely romance, that notion is set aside from the moment we first encounter Howard Hughes (Beatty). Like the real man, he is larger than life and at this point he is showing more and more of the eccentricities that dominated the latter portion of his life. He disdains the public eye and light, spending most of his time in dimly lit settings. As the story moves from the flashback forward, we see Frank progress to a more central role in Hughes’ life and business and how he is dragged along when Hughes flees Hollywood for Las Vegas and later points outside the United States. Things transpire that drive Frank and Marla apart and change all of their lives. We see Hughes become more and more withdrawn and displaying increasingly odd behavior until we arrive back at the beginning in that hotel room, to wait and see if he will place that very important call. We have seen a number of films depicting either Howard Hughes or someone modeled on him. “Willard Whyte” in 1971’s James Bond entry Diamonds are Forever is a character based on Hughes. Marvel Comics creator Stan Lee is on the record saying that Tony Stark, better known as “Iron Man” is also based on Hughes. Both Jason Robards and Leonardo DiCaprio have played the billionaire in films. Based on what has been written and told about the man, Beatty’s portrayal of Hughes seems quite realistic. His performance shows the progression of Hughes from larger-than-life icon to bedridden hermit. Alden Ehrenreich and Lily Collins have great chemistry. We are also treated to great visuals of Los Angeles in the era being displayed as well as small turns by a large cast of very talented actors. Alec Baldwin’s “Robert Maheu” is particularly enjoyable to anyone who knows more than a little about the real man. Matthew Broderick, Martin Sheen and Candice Bergen have supporting roles and we also see Ed Harris, Amy Madigan, Paul Sorvino and Oliver Platt in smaller parts. While Frank Forbes and Marla Mabery are not real people, many of the people and almost all of the events depicted are from the actual history of Howard Hughes. There are many biographies of the man you can pick up to get the “real story” if you wish, after viewing Rules Don’t Apply. Plot: An unconventional love story of an aspiring actress, her determined driver, and the eccentric billionaire who they work for.